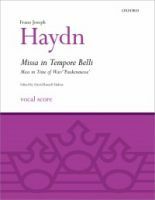 This is one of the finest of the six great Haydn masses in an edition prepared from Haydn's autograph which fully integrates both the original Eisenstadt and expanded Viennese orchestrations. The specially prepared piano reduction provides a full and practical representation of the instrumental textures. Orchestral material is available on hire.